There are lots of cool things that can be done to these old trucks. Some are modifications to make them a little more modern or user friendly. Some are trick customizing details. Some are just ways to make the old stuff last a little longer. This is an atempt to record some of those ideas and provide a place to view them. Please share if you have anything to contribute. Thanks. On this page you'll find stuff that, to say the least, is unusual. This like sketches of a Blazer version, an extra long bed pickup, airport limos and a photo shop version of an extented cab pickup. Or how about an Avalance? Do you have anything to add? Pass it along! Go to this page and look at some of the nice looking trucks that contributors have added to the Idea Page. It's a nice collection of trucks that will spark your imagination and inspire you to make yours a little nicer! 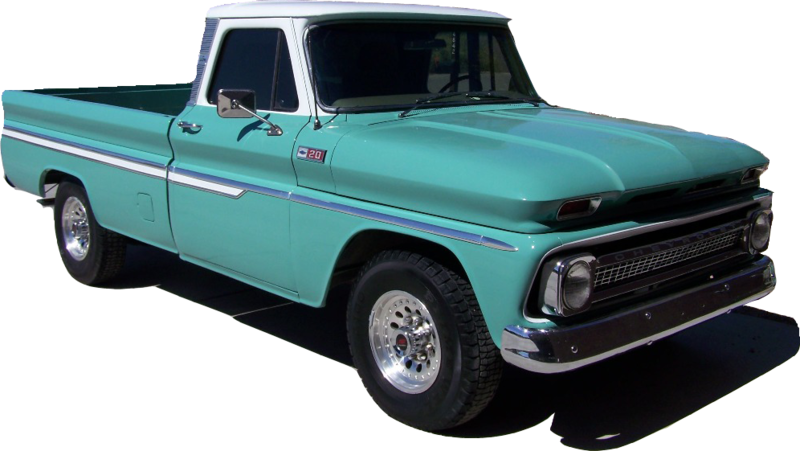 Here's the1965 Chevrolet Truck, Pickup Models, Sales broucher and a '63 Broucher. If you happen to have other years you wish to share, they can be added here with no trouble. Let me know. Thanks. Here are a couple of items that are posted as Reference for those who are looking for T-221 transfer case information. Here are a couple of my favorite links. The guys that put these sites together have a real love for these old trucks and have gone above and beyond to provide this great information for the sole purpose of preserving our trucks and providing us with a little extra knowedge and inpiration to keep going. In 1999, I bought this '65 C20 with a 292 cid/4-speed transmission and factory air at a yard sale here in Tucson. A couple of years later I was happily driving in my new truck with 350/700R4 in cool air-conditioned comfort. Now, some 10 years later, a new paint job brings a more retro look and has become a real head-turner. Here is a site you have to see for some great truck ideas. A few of the well-documented ideas include: Camaro hood louvers, '64 Impala taillights on Stepside fenders, rear stake pocket replacement, 4" bed widening, Camaro dash, floor-mounted parking brake lever, cool grill modification, cab vents, and a ton of other items. John (lakeroadster on chevytalk.com) has done a great job of giving details on each of the changes he's done on his '65 Stepside.